All these plots are used primarily for model diagnostics. In this example, the automobile seat-belt data that are discussed in Example 27.1 are revisited. In Example 27.1, the question under consideration is whether the data show evidence of the effectiveness of the seat-belt law that was introduced in the first quarter of 1983. An intervention variable, Q1_83_Shift, was used in the model to measure the effect of this law on the drivers and front-seat passengers who were killed or seriously injured in car accidents (f_KSI). In the current example, the analysis of these data begins without the knowledge of this seat-belt law. In effect, the same model is fitted without the use of the intervention variable Q1_83_Shift. The PLOTS=ALL option in the PROC SSM statement turns on all the plotting options. 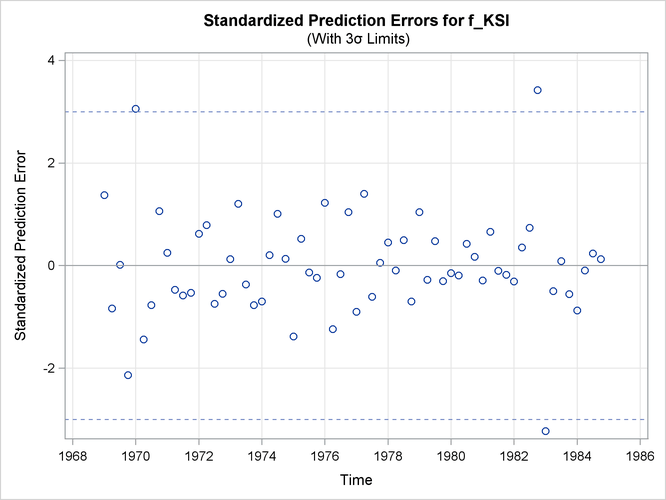 Because there are two response variables, nine plots in total are produced: a separate set of four plots—two residual and two prediction error—is produced for f_KSI and r_KSI, and one maximal shock plot is produced. Only three of these plots are shown here. 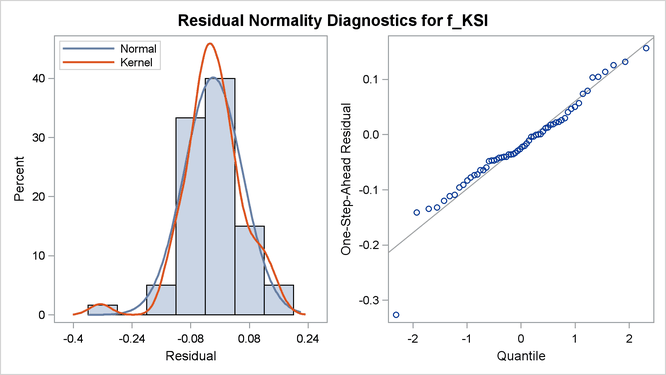 Output 27.8.1 shows the normality check for the one-step-ahead residuals for f_KSI. It shows some evidence of lack of normality. Output 27.8.3 shows the time series plot of maximal shock statistics. This plot can be very informative in showing the temporal locations of the structural changes in the overall observation-generation process (treating the fitted model as the reference). It can indicate locations of shifts in the process level or shifts in other characteristics, such as its slope. The precise nature of the shift (whether the shift occurs in the level or in some other aspects) can be determined by using the CHECKBREAK option in the appropriate STATE and TREND statements (as is done in the STATE statement in this example that defines the bivariate state level). In this example, the maximal shock statistics plot indicates two locations—the last quarter of 1973 and the first quarter of 1983—as likely locations for the structural breaks that are associated with the traffic accident process. These are indeed reasonable findings, because the last quarter of 1973 (beginning in October 1973) is associated with the start of the oil crisis that severely curtailed worldwide automobile traffic, and the first quarter of 1983 is associated with the introduction of the seat-belt law that might have improved the safety of drivers and front-seat passengers. In addition, Output 27.8.4 shows the summary of most likely break locations for the bivariate state level. It identifies a break in the first element of level (which corresponds to the drivers and front-seat passengers) in the first quarter of 1983. Note that using Q1_83_Pulse in the definition of level is equivalent to using Q1_83_Shift in the MODEL statement for f_KSI in Example 27.1. Output 27.8.5 shows the estimated change in the first element of the state level, which is the same as the estimated level shift shown in Output 27.1.6 (this is not surprising, because these two models are statistically equivalent). In the preceding SSM procedure statements, the CHECKBREAK option is used along with the PRINT=BREAKDETAIL option, which produces a table that contains the break statistics at every distinct time point (this table, in turn, is captured in the output data set stateBreak for later use). 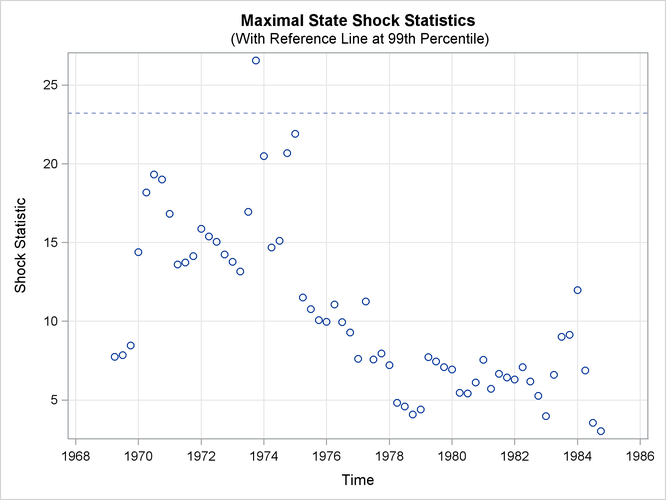 Output 27.8.6 shows the time series plot of maximal shock statistics for this revised model. 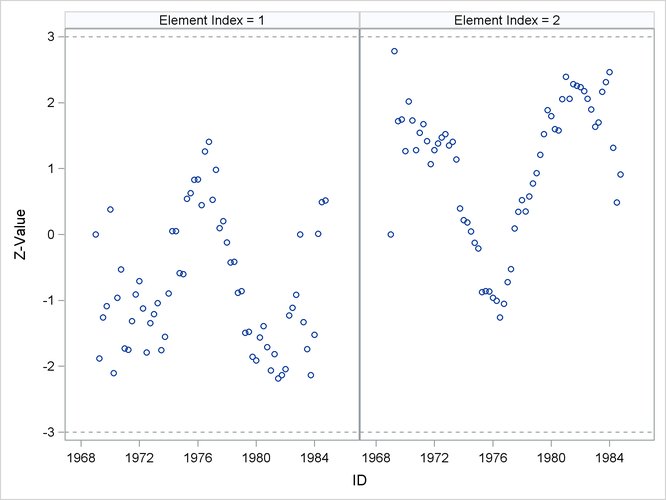 As expected, the plot no longer shows the first quarter of 1983 as a structural break location. It continues to show the last quarter of 1973 as a structural break location, because the fitted model does not try to explicitly account for this shift. Note that the reference line in Output 27.8.3 is drawn at the 99.9th percentile, whereas the reference line in Output 27.8.6 is drawn at the 99th percentile. The reference line location in the maximal state shock chi-square statistics plot is based on the points in the plot. 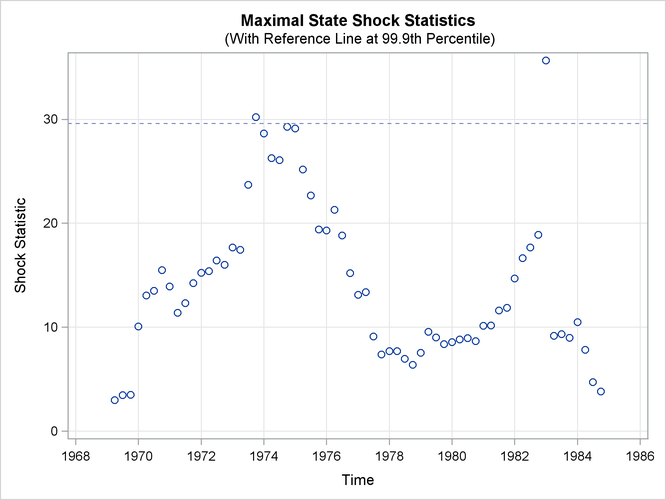 A reference line is drawn at percentile 80, 90, 99, or 99.9 based on the largest maximal shock statistic that is shown. The resulting graph, shown in Output 27.8.7, shows possible breaks in the second element—rear side passengers—around 1969. In general, however, the evidence of breaks in the elements of level is not very strong. This means that you must look elsewhere to explain the extreme point in Output 27.8.6.